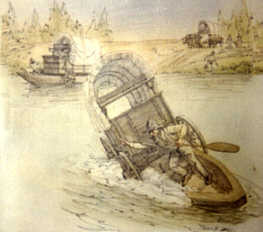 River crossings were difficult for Oregon Trail emigrants and the Snake River was no exception. Emigrants, wagons, and livestock all had to cross the river; casualties were common. Celinda Hines, emigrant of 1853, watched in horror as her father vanished into the depths of the Snake River at this crossing: “Uncle G swam in & got out Pa’s hat”, she lamented. Fortunately, local Indians could be hired to assist emigrants at this river crossing. For Basil Nelson Longworth, emigrant of 1853, crossing the Snake River near this site was easy with the help of the newly established ferry: “we ran both wagons on the boat and in a few minutes were safely on the other side.” Before the ferry was established, river crossing required careful planning and considerable creativity. Chinese and European aristocrats of the early 19th Century had one thing in common, and it was the best that money could buy – a genuine beaver hat! Half a world away, in the Oregon Country, the British Hudson’s Bay company was doing all it could to remain the primary supplier of furs to make those hats. When American fur traders built Fort Hall as a trading post in what is today southeastern Idaho, the Hudson’s Bay company built Fort Boise across the Snake River from this site to oppose them in 1838. By the mid 1840’s trappers had depleted the beaver population; Fort Boise and Britain’s claim to the Oregon Country was in rapid decline. Oases along the Oregon Trail were few, and Fort Boise was one of them. Emigrants stopping at Fort Boise in the 1830’s were greeted and assisted by friendly Indians; they were also offered hospitality that only the Hudson’s Bay Company could provide. 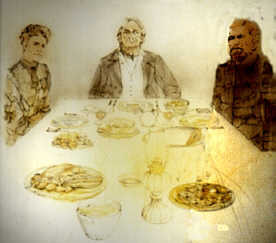 Sydney Smith, emigrant of 1839, feasted at a table laid with“fowls, Ducks, Bacon, Salmon Sturgeon Buffalow and Elk… Turnips Cabbag & Pickled Beets…” The banquet was hosted by the clerk of the fort, Francois Payette, a gentleman who could make an emigrant temporarily forget the privations of the wilderness. “Mr. Payette, the person in charge at Boisas, received us with every mark of kindness; gaveour horses to the care of his servants, and introduced us immediately to the chairs, tables, and edibles of his apartments. 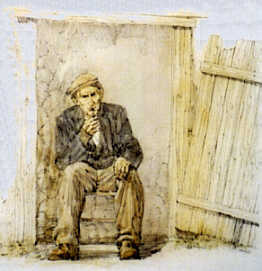 He is a French Canadian; has been in the service of the Hudson’s Bay Company more than twenty years, and holds the rank of clerk; is a merry, fat old gentleman of fifty, who, although inthe wilderness all the best years of his life, has retained that manner of benevolence in trifles, in his mode of address, of seating you and serving you at table, of directing your attention continually to some little matter of interest, of making you speak the French language…” Thomas Jefferson Farnham. The beaver population was decimated by the 1840’s; fur trade was in decline, and so too was Fort Boise. 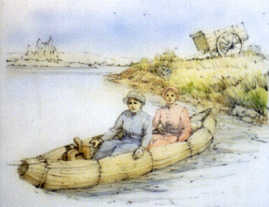 Although friendly Indians were still available to assist crossing the Snake River, many emigrants were shocked by the dilapidated condition of the oasis described so lavishly by those who had gone before them. Charlotte Stearns Pengra, emigrant of 1853, called Fort Boise “that world renowned spot of one miserable block house going all decay…” For emigrants in need of provisions, the Fort’s demise was a serious matter. “…a great many had depended on getting provisions here but failed entirely of anything but fish – There is little sugar for sale here at .75 pr pound – Prospects seem to darken entirely around us a good deal for some families are already entirely out of bread and many more will be in the course of one or two weeks – We have enough to last us through but we shall have to divide if necessary.” Cecilia Adams and Parthenia Blank; September 20, 1852.